Cara Delevingne was a busy little bee over the Thanksgiving holiday, and when she wasn’t traipsing through Disneyland with her best gal pals, the British model somehow found time to add a brand-new finger tattoo of a wasp to her collection. On the hand opposite her famous finger tattoo of a lion’s head, Cara’s new tattoo features a small black wasp inked on the middle finger of her left hand. The model hasn’t said much about her wasp finger tattoo is public, but we just happened to notice that the ink is almost identical to the bumblebee tattoo Kelly Osbourne recently had inked in white on her shoulder in honor of the late Joan Rivers. After participating in an epic dance battle with Kate Hudson and her family on Thanksgiving Day, Cara Delevingne spent the weekend living it up in Disneyland with gal pals Kendall Jenner and Gigi Hadid. Judging by the photos of the trio screaming like little kids on the Disneyland rides and sporting adorable Minnie Mouse ears, the girls had a jam-packed day full of fun, but the inked-obsessed Cara still managed to take a break to add tattoo number 16 to her ever-growing collection. 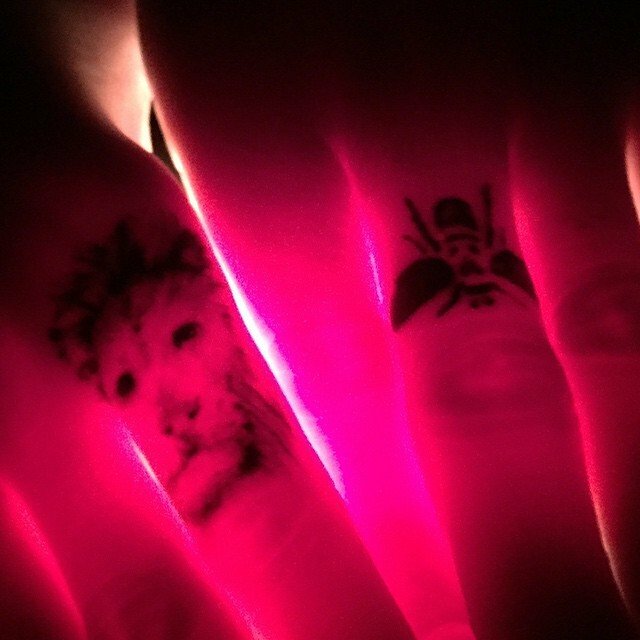 Cara Delevingne showed off her new wasp finger on Instagram on November 29, holding her hands over a light so both her wasp and lion finger tats appear to be glowing red. Oddly enough, the birds and the bees have turned out to be popular tattoo designs of late, and Cara isn’t the only celebrity to add an insect or bird tattoo to her body recently. In addition to the bumblebee tattoo Kelly Osbourne recently had inked on her shoulder as a tribute to her friend and mentor, Joan Rivers, Robin Williams’ daughter Zelda got a sweet hummingbird hand tattoo dedicated to her late father, and “Modern Family” star Sarah Hyland added a similar hummingbird tattoo behind her ear just two weeks ago. Cara Delevingne’s tattoo of the wasp comes with a special bonus though – it is certain to add a little extra sting the next time she decides to flip someone the bird!